Presenting a new video with narrative by Ajarn Spencer Littlewood in our new series of videos ‘Amulet Talk’ which present you with the first of many insightful videos with narratives, to increase your awareness, and to bring interesting aspects of the topic of Thai Buddhist Amulets to you for your enjoyment. We hope this new series of videos provides you with useful study material. This episode of Amulet Talk provides a look at two Pra Somdej Pim Chedi Norn Wat Lakorn Tham, from two great master monks, which feature Buddha images seated over one of the horizontal ‘sleeping’ chedi stupas of Wat Lakorn Tam. We invite you to enjoy the HD Video and Narrative by Ajarn Spencer Littlewood, which gives a basic look at these two amulets which have a semi tenuous relationship to each other, but which are also completely distinct from each other. The Pra Somdej Chedi Norn Wat Lakorn Tham amulets of Luang Phu Nak (Wat Rakang Kositaram) and The Pra Somdej Hwaek Man Pim Chedi Norn of Luang Por Supoj (Wat Sutat). The amulets represent the two chedi stupas at Wat Lakorn Tam temple, which were built and installed by the great Somdej Pra Puttajarn (Dto) Prohmrangsri of Wat Rakang Kositaram. 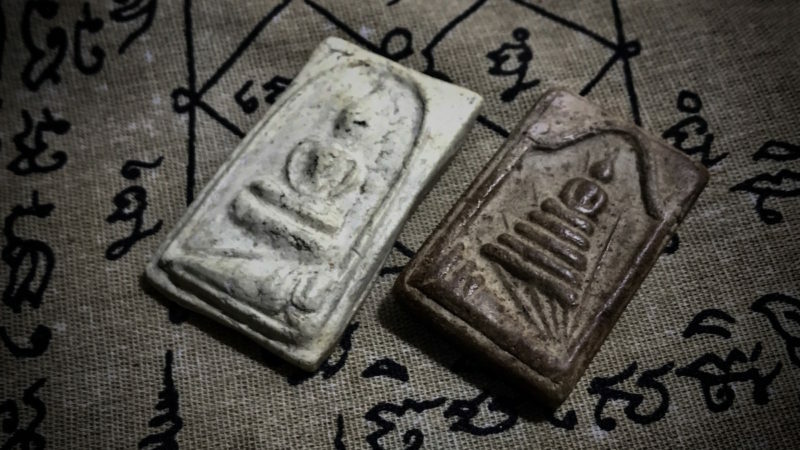 The two amulets are made by Luang Phu Nak of Wat Rakang Kositaram in the year 2495 BE (left side in white Puttakun Powders), and from Jao Khun Sri Sonti (Luang Por Supoj) of Wat Sutat, for the Indojin Indo-China Wartime Blessing ceremony, made in Nuea Wan Pasom Pong Gao. There were actually three different masters who made Pra Somdej Pim Chedi Norn, the third being Luang Phu Hin of Wat Rakang Kositaram, whose amulet is not shown in this vide, but which we will show when we obtain an example, in a future video. 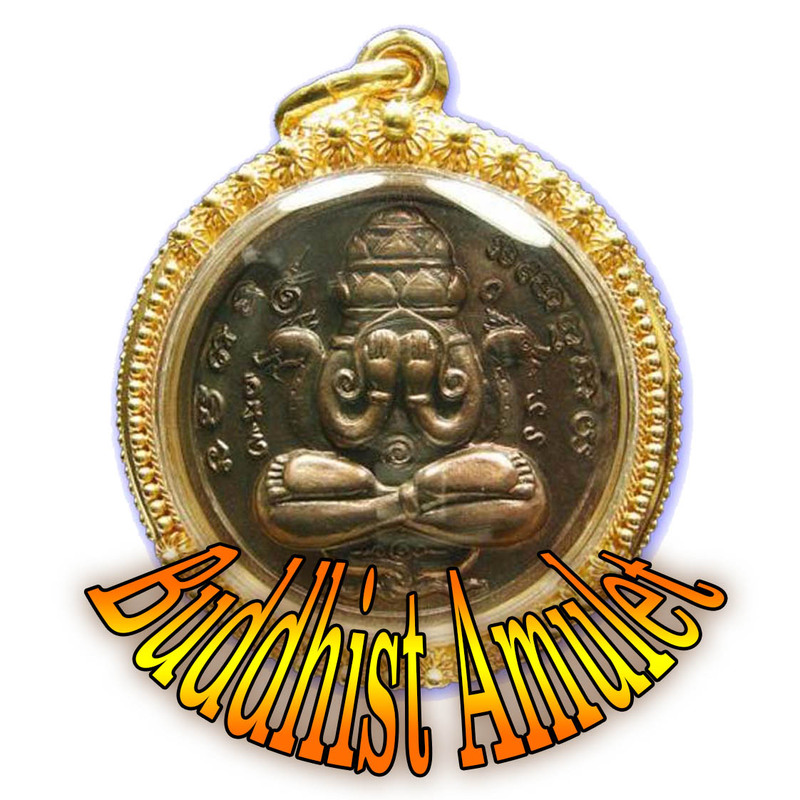 Both amulets from both masters (who were colleagues of each other), were made using broken pieces of ancient Pra Somdej Wat Rakang Kositaram amulets from the time of Somdej Pra Puttajarn (Dto) Prohmrangsri. 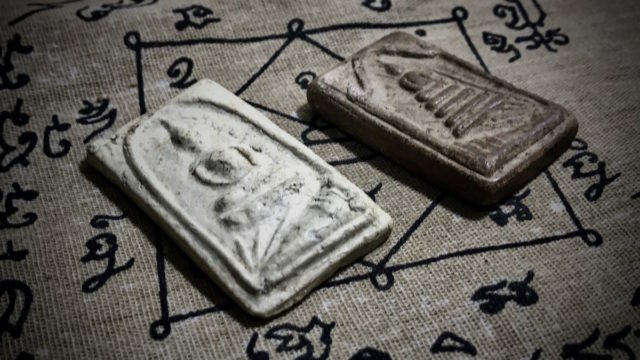 The amlets are however distinct, and made at different times, with different designs, the only things in common truly being the Muan Sarn Sacred Powder content using ancient Pra Somdej Wat Rakang Kositaram, and the imagery of the sleeping Chedi Stupas of Wat Sutat. otherwise, the Buddha images and their outer arches, and daises, are distinct and apart from each other. For example, the Buddha on the Pra Somdej Chedi Norn Luang Phu Nak has a single tiered dais, whereas the Buddha on the Pra Somdej Chedi Norn Luang Por Supoj, has four tiered dais.